The Indian army is one of the largest and oldest institutions in the country. 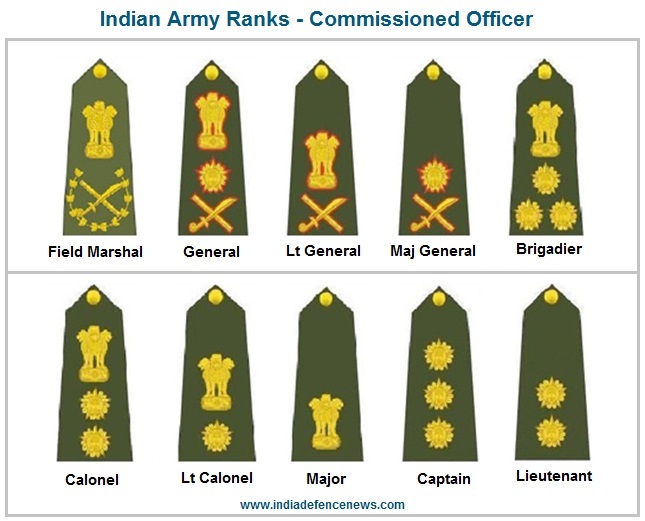 The Indian army has well-defined rank based hierarchical structure. A proper understanding of Indian Army Ranks is important especially for the aspirants of NDA , CDS , AFCAT and other competitive examinations. In this article, we will discuss in detail Army Ranks , Insignia , Hierarchy and command structure. Indian army is the second largest army in the world with strength of almost 1.3 Million which includes 1,237,117 active personnel and 960,000 reserve personnel. The Indian army is 123 year old institution founded on 1st April 1895 during the British Rule over india . The main objective and primary mission of the Indian Army is to defend the Indian State against external aggression , ensure National Security and integrity of India . The Indian army is also deployed in a situation for maintaining peace , law andorder,, and internal security within the country . The President of India is the Supreme Commander of the Indian Armed Forces which consist of Indian Army , Navy and Air Force . The Indian Army is going through a process of modernization. The Indian army is being equipped with latest weapons such as latest tanks , artillery guns , SAM ( Surface To Air ) batteries and SSM ( Surface To Surface ) missiles. The Indian Army operates on a regimental structure. 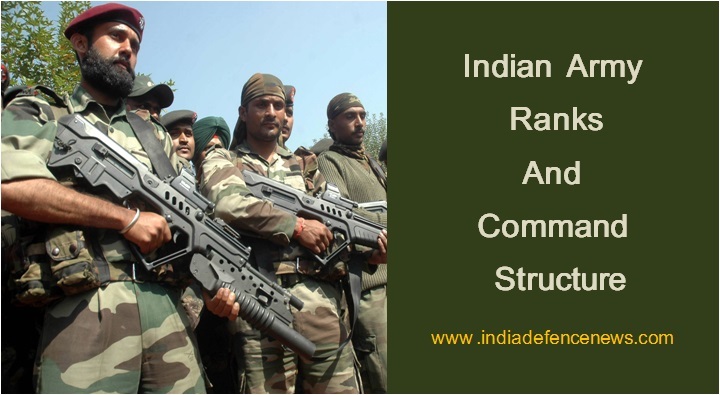 The command structure within the Indian army is based on the rank and also the geographic location of the unit. Junior Commissioned Officers ( JCO). The Indian army distinguishes between commissioned and non-commissioned officers by their roles , On the job duties, respective ranks, the authority delegated and their pay scale structure . The Non-Commissioned Officer ( NCO ) is an Indian military officer who has not earned a formal designation of commissioned Officer ( Also referred as Commission ) . The Non-Commissioned personnel usually perform duties based on specific skills such as training, recruitment , technical jobs or military policing. The NCO is considered to be the backbone of the army operations. 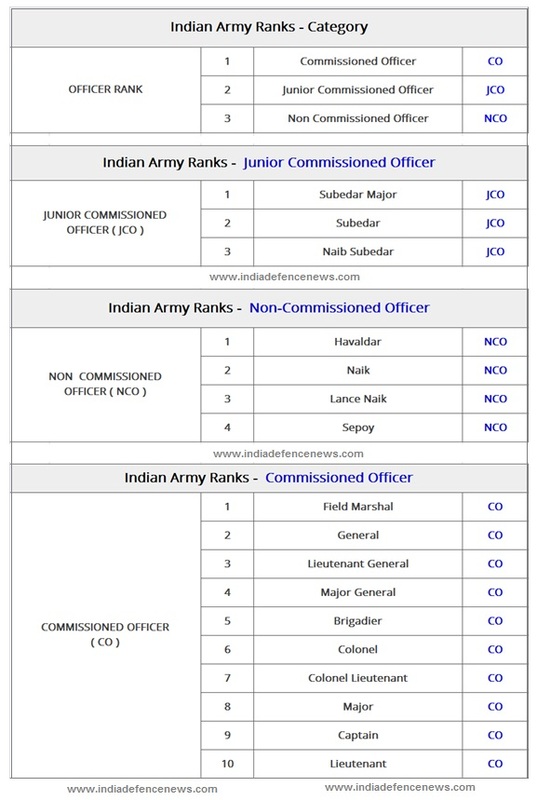 In the Indian army , the NCO can be promoted to JCO rank either from junior ranks based on the eligibility . The Commissioned officers are in the management cadre performing leadership roles. The Commissioned Officers provide the necessary direction and management expertise to perform various military operations on the ground . The CO’ s assign lower ranks NCO their duties , missions, their assignments and their orders. The NCOs are responsible to supervise lower ranks army personnel to ensure that the assignments are performed properly and get the job done. In the Indian army, the JCO can be selected either from junior ranks based on the eligibility criterion Or directly through recruitment exams conducted. The Field Marshal rank is the highest ceremonial rank in the Indian Army. The Field Marshal Rank is awarded in recognition of extemporary service to the Indian Army . As of now , in Indian army, only two officers have been elevated to the rank of Field Marshal and these officers include Field Marshal Sam Manekshaw and Field Marshal KM Cariappa . The Field Marshal KM Cariappa was the first commander in chief of the Indian Army elevated as Field Marshal. He was Chief of Army staff during the first India Pakistan war just after the independence in the year 1947 . In this war , the Indian army defeated the Pakistani army and stopped the Pakistani forces from capturing the Indian Kashmir . This war is also referred to as the first Kashmir war. The Field Marshal Sam Manekshaw became the second chief of the Indian Army who has been elevated to the ceremonial rank of Field Marshal. He was Chief of Army staff during the second India-Pakistan war in the year 1971 . In this war , Indian army defeated the Pakistani army and liberated Bangladesh as an independent country . This war is also referred to as the Bangladesh Liberation war. This rank is operationally the highest rank held by an Army officer who is generally the Chief Of Army Staff ( COAS ) . This rank is considered to be an equivalent of cabinet secretary. General Bipin Rawat is currently holding the charge of COAS . COAS Retirement : The retirement age for COAS is either 3 years after being appointed as COAS OR at the age of 62 years , whichever is earlier . The Indian army appoints Lieutenant Generals only by selection and the eligibility criterion is after completing 36 years of commissioned service in the Indian Army . the Lieutenant General may hold the position of a Vice Chief of Army Staff ( VCAS ) or Army Commander. Retirement : The retirement age for Lieutenant General Rank Officer is 60 years. Insignia : Five-pointed star over crossed baton and sabre. The Indian army Major Generals ( Abbreviated As MG / Maj Gen ) are promoted from commissioned officers by selection . The eligibility criterion for MG rank is 32 years of service as a commissioned officer in service with the Indian army . Retirement : The retirement age for Major General Rank Officer is 58 years . The Indian army appoints Brigadier through the selection process. The eligible commissioned officers are promoted by selection . The eligibility criterion for Brigadier rank is 25 years of service as a commissioned officer in service with the Indian army . Retirement : The retirement age for Brigadier rank officer is 56 years . The Colonels in the Indian army are promoted by the selection process . The eligibility criterion for Colonel Rank Officer is after 15 years of service as commissioned Officer OR eligible officer may be promoted on seniority basis after completing 26 years as a commissioned Officer with Indian Army . However, the officers promoted on Time-scale Colonels may hold the portfolio of a Lt. Colonel. Retirement : The retirement age for Colonel rank officer is 54 years . Insignia : National emblem over five-pointed star. The Lieutenant Colonels in the Indian army are promoted by the selection process . The eligibility criterion for Lieutenant Colonel Rank Officer is after 13 years of service as a commissioned Officer and subject to clearance of Part D exam. The rank of lieutenant colonel is often shortened to simply “colonel” in conversation and also in unofficial correspondence. The Indian army appoints Major through the selection process and time-bound promotion on completion of at least 6 years commissioned service with the Indian army . The Indian army appoints Captain through the selection process and a time-bound promotion on completion of at least 2 years commissioned service with the Indian army . The Indian army appoints Lieutenant on commissioning into the Indian Army as an Officer. The Indian army appoints Subedar Major Or Risaldar Major either by promotion Or by selection amongst eligible candidates . Retirement : The retirement age is after completing 34 years service or at the age of 54 years , whichever is earlier. The Indian army appoints Subedar Or Risaldar either by promotion Or by selection amongst eligible candidates . Retirement : The retirement age is after completing 30 years service or at the age of 52 years , whichever is earlier. Retirement : The retirement age is after completing 28 years service or at the age of 52 years , whichever is earlier. Retirement : The retirement age is after completing 26 years service or at the age of 49 years , whichever is earlier. The Indian army appoints Naik Or Daffadar either by promotion Or by selection amongst eligible candidates Promotion by selection. Retirement : The retirement age is after completing 24 years service or at the age of 49 years , whichever is earlier. The Indian army appoints Lance Naik Or Lance Daffadar either by promotion Or by selection amongst eligible candidates Promotion by selection. Retirement : The retirement age is after completing 22 years service or at the age of 48 years , whichever is earlier . A Sepoy working in Signals will be called as Signalman. A Sepoy working in Infantry will be called as Rifleman. A Sepoy working in the Armored Corps is called as Gunner.